OK so my newest hairstyle that I have perfected is the waterfall braid. I love this hairstyle for so many reasons. First it is super easy and fast, yet it looks like it took a lot of effort. This is a good braid for me because while it pulls hair back from my face it still leaves me volume in front instead of pulling it all back. 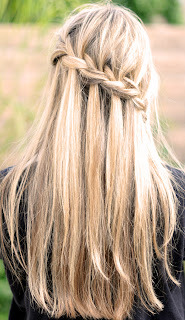 I have tried this braid with my hair curly, wavy, and straight and I like all the results. Also it really looks cute jazzing up a pony tail! If you don't know to braid this way, it actually is super simple. For more detailed step by step instructions look on YouTube, but I figured out how to work it just from written instructions. Basically it is just like french braiding. On the top side you pick up just like normal but on the bottom side you either drop half the section and continue braiding with the rest of the section or you drop the whole section and pick up a new section right behind it. There are two different ways of doing this braid and they do look slightly different. If you want a big braid I would drop the whole section because it needs more hair to fuel the braid. If you want a smaller daintier braid I would do the half section route. Also if you have really fine hair that will slip easily I would go for the half section braid because it is tighter and will probably stay in your hair better. 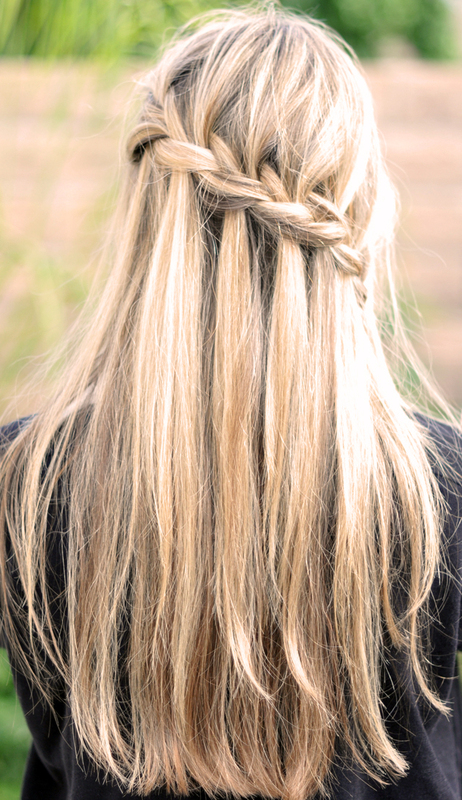 Try the braid, it looks amazing!